Any business requires a short-term and a long-term goal plan in order to give the team a vision and understanding of what their efforts are going into. 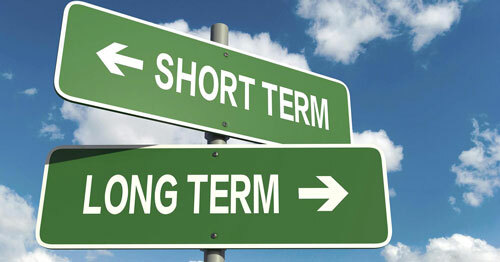 Short-term goals entail the preliminary steps taken on a shorter time frame like a day-to-day or week-to-week basis that eventually adds up to achieving the desired long-term goal. It is crucial for a marketing professional to not just have a basic knowledge of the client's short-term and loan-term goals, but also align the marketing goals with the company’s goals. This sets up the game plan and lays a strong foundation for the success of the client. increasing sales and influx of new customers. This is one of the most basic objectives for a marketing professional. A client can clearly measure the success of a marketing professional’s work through increase or decrease in business leads and revenue. Similar to most modern businesses, a company’s website serves as the business’s digital home-base. More traffic on the website likely leads to more customers. While traffic is a good indicator of having achieved a short-term goal, conversions ultimately lead to paying customers. A marketing professional would incorporate techniques to encourage website visitors to buy the client’s products. On social media, the number of followers in general are not as good a measure as engagement rates. While a decent number of followers are important for branding the business, it simply implies that more people see the customer’s posts. Whether the same customer engages regularly with the customer is a different measure altogether. Which is why, another example of a good short-term goal is to magnify the customer’s engagement rate or to lower the response time to customer inquiries. Engagement rate indicates the frequency at which people interact with the client’s posts on social media, usually quantified by comments, likes and shares. Higher engagement rate indicates that the potential customer base resonates with the brand’s content and posts. As for the same client’s long-term goal strategy, brand recognition is essential in growing their business. Potential consumers are more likely to believe in the brand names of reputed companies. This is a long-term goal every new business strives for and every marketing professional aims to achieve. Furthermore, as the client’s business expands and brand awareness is built, it automatically comes with more exposure in the relevant forums. Common instances of these include being featured in the local news, being published in featured articles of relevant magazines, or being promoted by a popular celebrity in the field. Content marketing assets such as blogs, videos and podcasts all contribute slowly, but surely in building the client’s brand image from scratch and aid in furthering long-term goals. Another basic, and most essential goal for a client would be appearing frequently on search engines. It’s the primary source on the internet through which people can discover your client’s product/service. Search engine ranking on websites like Google and Yahoo! get a client’s website organic traffic and potential leads. Search engine optimization takes a great amount of time and effort but with the help of marketing professionals and their team of digital marketing experts, it can be made more achievable. Additionally, a crucial long-term goal of a business is its ability to retain the existing customer base. Gauging customer satisfaction via feedback mechanisms helps provide a fair understanding on customer loyalty in order to sell new solutions to existing customer or to sell more of the same product to them. A professional would be able to inculcate sound marketing strategies to help a business work towards these goals. Not using marketing professionals often leads to the clients practicing counterintuitive marketing concepts which work against their goals. It is recommended that businesses, especially newer ones take the guidance of marketing professionals in their market strategies and launch of new initiatives.